Do you have a lot of outdoor summer activities planned? Around here, we have a few fun things on the calendar with lots of downtime. I’m looking forward to getting outside with the kiddos at least a few times but I was short on idea. I recently caught up with Joe from Nature Rated and he had some great tips for getting the kids outside so I wanted to share them with you! As much as kids love summer vacation, keeping them busy can be a real chore! Summer camps are great, but I don’t want my boys to have back-to-back scheduled activities. That said, with my work schedule, I still need to make plans to get us all outside. I love these suggestions from Joe at Nature Rated. He put together an infographic with 15 Summer activities to help your kids appreciate nature and I definitely want to try a few. Click through to grab instructions or pin it for later! From baking a blackberry pie to constructing a pond or insect hotel, there’s plenty for the youngsters to get up to. I’m thinking we will decorate a tree, make a nature table and maybe try the light trap. Which ones would your kiddos love? Head on over to Nature Rated for step by step instructions for each idea and get your kids out and about enjoying nature! 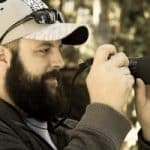 An outdoor enthusiast, Joe is the lead editor at Nature Rated; a website which rates and reviews the best outdoor gear for people who quickly want to know what to get. He believes in no fluff, to the point reviews, which help you choose the right gear for your next adventure. Whenever daily life gets him down he heads to the nearest lake or river with his kayak and camera spending time recharging his batteries. Want more ideas? Check out the Be Out There ebook I contributed to a few years ago!